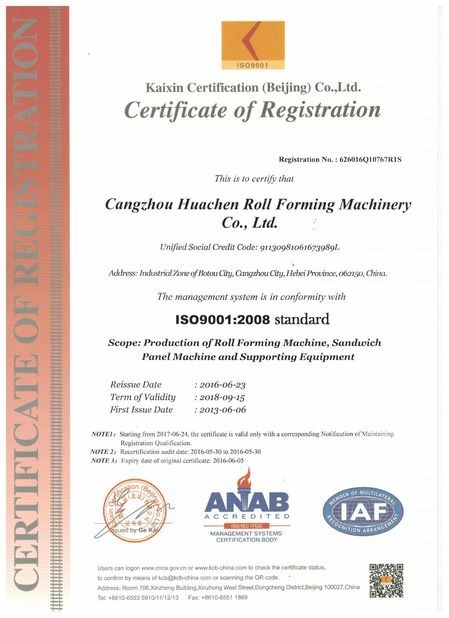 Cangzhou Huachen Roll Forming Machinery CO.,Ltd. Not only focus on complete a machine but also perfect every detail. Machine easy to use. 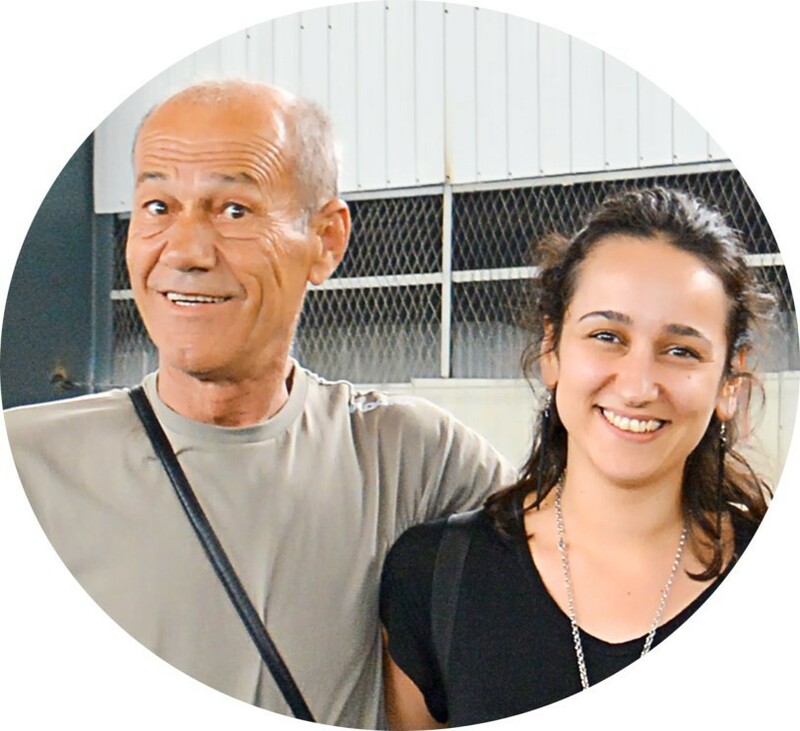 The boss is very nice. This is a good manufacturer, a good English communicater, and I like your machines. It is good quality, and pretty! Nice supplier! I like your swift delivery and quick production cycle, will keep in touch with you guys. 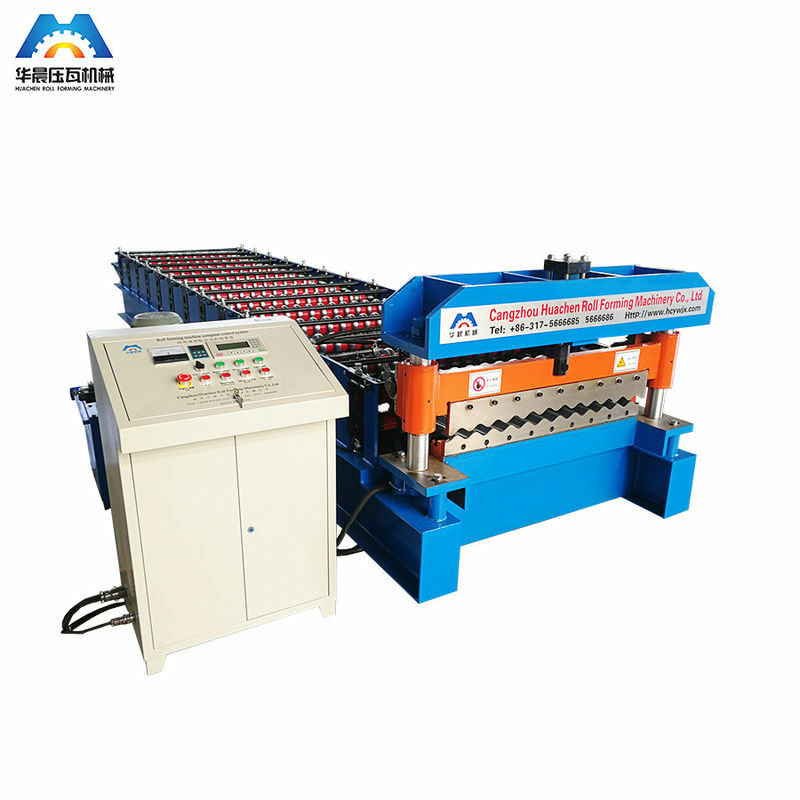 In recent years, with the development of screen, canning production line, instrument, automobile, hardware and other industries, the demand for tile press equipment is increasing. 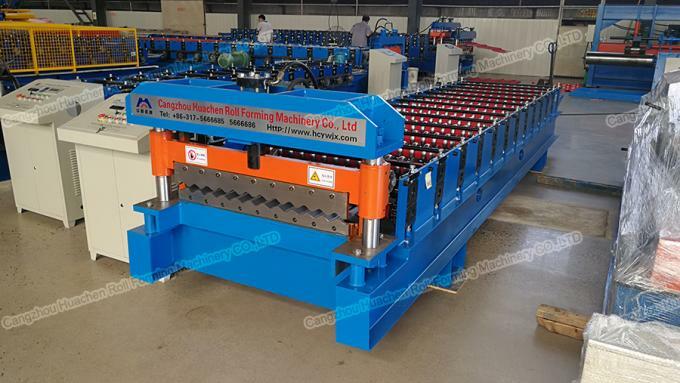 After market research, in order to meet the needs of small and medium-sized enterprises, the research and development task of developing multi position CNC rotary die pressing tile machine for pressing tile machine has been established. The upper and lower part of the upper and lower part of the upper and lower part of the upper and lower part of the lower die system respectively installed a set of worm gear drive mechanism which is driven by a pair of synchronous motor and synchronously rotates the upper and lower modes. It is characterized by the upper die system including the uploading sleeve and the upper rotation. The lower and lower worm gear transmission mechanism is fixed on the shearing machine seat frame, the upper and lower worm wheels are mounted on the upper and lower transmission sleeves, the punch and the concave die are installed in the upper and lower rotating sleeves, and the rotating sleeve and the socket are installed on the tile press. Up and down on the turntable. 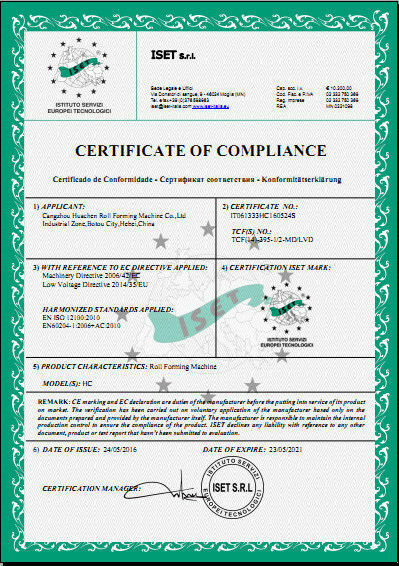 The upper and lower die system and the lower die system each install a set of worm and worm gearing fixed on the frame of the shearing machine and driven by a pair of synchronous motors. The transmission sleeves of the upper and lower mode system are fitted together with the rotating sleeve respectively, and driven by the synchronous rotating worm and worm drive device. Through the control of the dialing on the upper and lower transmission sleeves, the transmission sleeve and the rotating sleeve are in a state of mutual disengagement or meshing, thus realizing the synchronous rotation of the upper and lower dies of the self rotating mould on the pressing machine, with high precision and arbitrary angle. The center line of the roller should be on the same plane line with the center wheel, the plane degree is not more than 1mm, the gap between the top and bottom rolls of each row is equal, and the gap deviation is +0.1mm. Use regular gauge or gauge to debug. 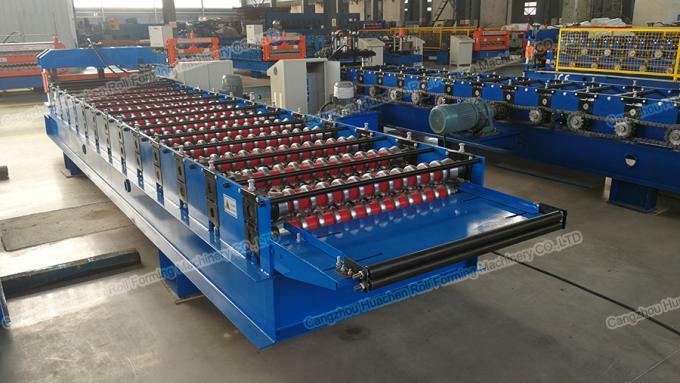 The press type plate rolled by this machine is not only elegant and elegant, but also elegant in appearance, smooth in appearance, uniform in ripple, high in utilization, high in strength, high in production automation, low in cost and durable. The product owners are widely applicable to large and medium-sized civil buildings, such as factories, locomotives, hangar, sports venues, theatres, etc. It will be equipped with a set of lubrication system. When the machine runs, it automatically lubricates all the bearing bearing and the moving guide rail of the transmission gear mechanism. 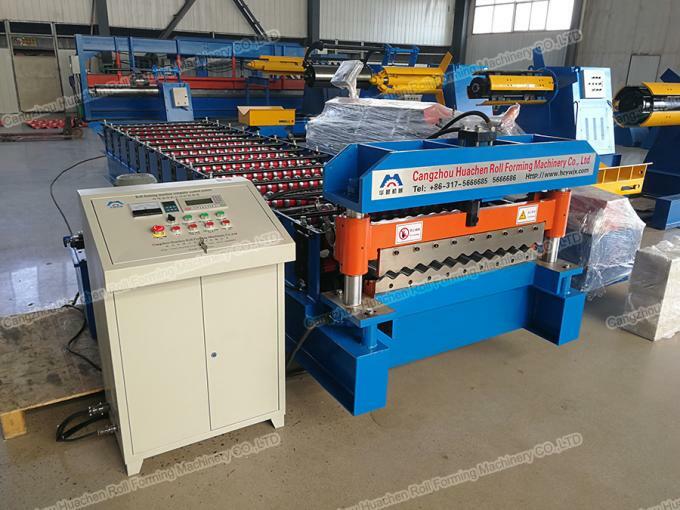 Automatic blanking, drawing blank work program: Die Installation and the main engine test the same, and then open air compressor, vacuum pump, extruder, cut tile machine, feeding machine, press machine, main and tile conveyor, stop the extruder, and stop the rest of the equipment. 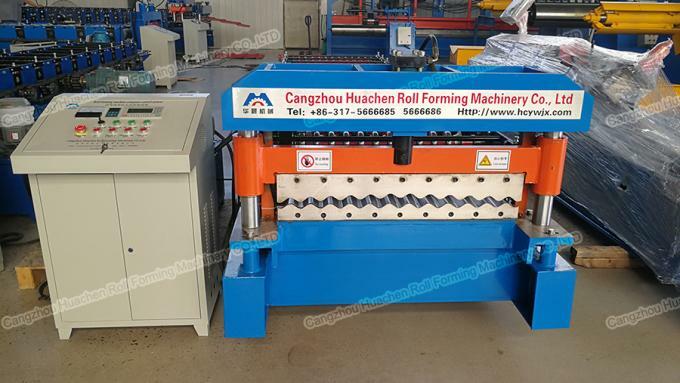 Cangzhou Huachen Roll Forming Machinery Co., Ltd.
China Good Quality Glazed Tile Roll Forming Machine Supplier. Copyright © 2014 - 2019 tilerollformingmachine.com. All Rights Reserved.